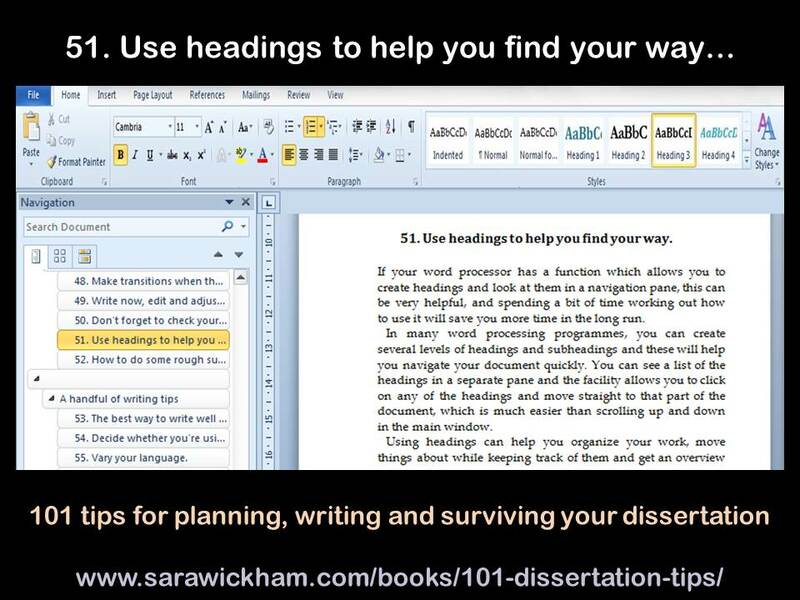 This is the first of a series of posts which share sneaky peeks at some of the tips in my book, 101 tips for planning, writing and surviving your dissertation. (Here are the second and third of the tips that I shared). I’m going to start with the tip that received the most exclamations from those who were involved in the book’s production; some of whom have managed to write at least one book and half a PhD thesis without knowing this and who feel that it is going to improve their lives now they’ve learned about it! “If your word processor has a function which allows you to create headings and look at them in a navigation pane, this can be very helpful, and spending a bit of time working out how to use it will save you more time in the long run. In many word processing programmes, you can create several levels of headings and subheadings and these will help you navigate your document quickly. You can see a list of the headings in a separate pane and the facility allows you to click on any of the headings and move straight to that part of the document, which is much easier than scrolling up and down in the main window. See the handy illustration on my blog post for an example of what I mean! You can read lots more about the book on this page, and it’s available from Amazon UK, Amazon.com, Amazon France, Germany, Canada, India, Italy, Mexico, Spain and the Kindle store.